Jarzynski was honored for outstanding research in theoretical statistical physics. The American Physical Society awarded its 2019 J.J. Sakurai Prize for Theoretical Particle Physics to Raman Sundrum, a Distinguished University Professor of Physics at the University of Maryland. Sundrum’s collaborator on two key papers, Harvard University Physics Professor Lisa Randall, also received the award. Sundrum and Randall were honored for making a number of theoretical predictions that set off a wave of experiments searching for theoretical subatomic particles—experiments that are still active today, almost two decades later. However, this dimension can affect particles. In particular, it can dramatically change the mass of particles, making the “true” mass of the particle match the mass predicted by quantum mechanics. Sundrum and Randall’s work, which became known as the Randall-Sundrum models, makes a number of other predictions. In particular, it predicts the existence of new types of gravitons, which are theoretical particles that carry the force of gravity. This prediction inspired experiments to look for gravitons using the Large Hadron Collider (LHC), the world’s largest particle accelerator located at CERN near Geneva, Switzerland. Sundrum learned about theoretical particle physics as an undergraduate student at the University of Sydney in Australia. After receiving his B.S. in mathematics and physics from the University of Sydney in 1984, Sundrum studied elementary particle theory at Yale University, where he received his Ph.D. in 1990. He then took several postdoctoral positions, including one at Boston University from 1996 to 1999. At Boston University, he studied “dark energy,” a theoretical form of energy that permeates the universe. Sundrum published a number of papers that tackled the topic using extra dimensions. These papers caught the attention of Randall, who invited Sundrum to collaborate. While they did not solve the mysteries of dark energy, their results turned out to be applicable to the hierarchy problem. 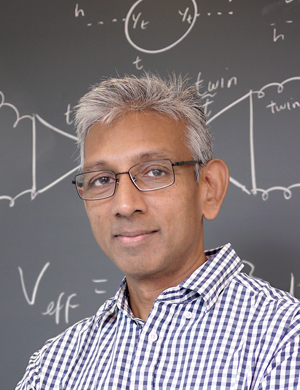 After taking a faculty position at the Johns Hopkins University, Sundrum came to UMD in 2010, where he continues to study particle physics in extra dimensions and other topics. Today, he is especially interested in warped extra dimensions as a source of macroscopic gravitational waves—such as those detected by the Laser Interferometer Gravitational-Wave Observatory (LIGO). In 2018, Sundrum and three colleagues from the Maryland Center for Fundamental Physics—Michael Geller, Anson Hook and Yuhsin Tsai—wrote a paper that is accepted for publication in the journal Physical Review Letters proposing to study the gravitational wave background. Unlike gravitational wave signals from black hole or neutron star mergers, signals from the gravitational wave background can originate from collisions between extradimensional bubbles in the very early universe. These extradimensional bubbles are related to the “bubbles” that make it possible to theoretically solve the hierarchy problem and can potentially teach scientists about the early universe. The paper, “Primordial Anisotropies in the Gravitational Wave Background from Cosmological Phase Transitions,” Michael Geller, Anson Hook, Raman Sundrum and Yuhsin Tsai, is forthcoming in the journal Physical Review Letters. The paper, “An Alternative to Compactification,” Lisa Randall and Raman Sundrum, was published in the journal Physical Review Letters on December 6, 1999. The paper, “Large Mass Hierarchy from a Small Extra Dimension,” Lisa Randall and Raman Sundrum, was published in the journal Physical Review Letters on October 25, 1999.